We present a transponder architecture for long range, remotely powered, sensor telemetry applications. Power and a reference clock are recovered from a 450 MHz incident RF signal, and data is modulated on a 900 MHz carrier. A high efficiency RF-DC converter generates a 3 VDC supply from a -12.3 dBm incident RF signal. An LC oscillator, injection locked to this incident RF signal, generates a high purity clock for high data rate transmission. A wireless operation range of more than 18 meters is indicated by anechoic chamber testing. 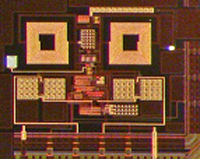 Two versions, one with BPSK modulation, and another with on-off keying modulation, are implemented in a 5-metal 0.25µm CMOS process. These devices also incorporate an ADC and a temperature sensor. The total die is less than 1.1 mm2.